A modern intensive economic development of Central Asian countries, and particularly development of relatively dry zone, creates prerequisites for water resources to become a tool for political pressure. However, countries need to remember that behind cubic kilometers of water there are lives of more than 10 million people. 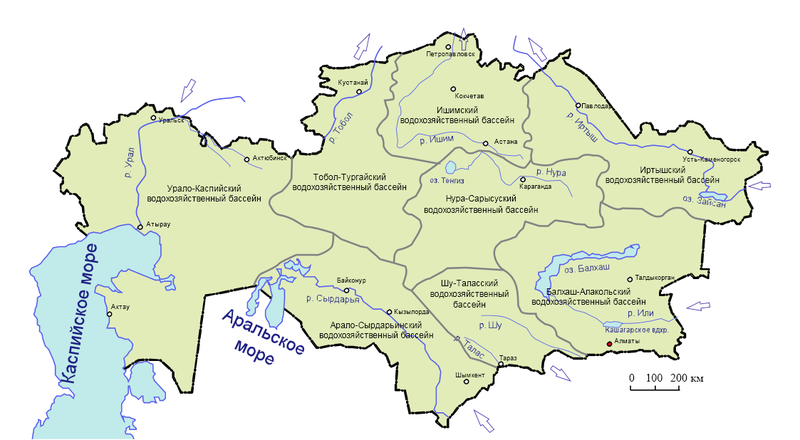 The territory of Kazakhstan is traditionally divided into eight water basins: the Aral-Syr Darya, Balkhash-Alakol, Irtysh, Ural-Caspian, Ishim, Nur-Sarysu, Shu-Talas and Tobol-Turgai. Except for Nur-Sarysu and Shu-Talas, all basins are formed to a different degree by the transboundary rivers originating in China, Kyrgyzstan, Uzbekistan and Russia. In this regard Kazakhstan is largely dependent on its neighbors in terms of water resources. The situation with water shortage primarily for needs of agriculture in different regions of the country is compounded by steady growth of water intake for economic needs in the neighboring countries, where the upper courses of the rivers run. According to forecast of Taraz Institute of Water Economy with mean volume of river water of 100.5 km3 surface water in Kazakhstan will decrease by 15-18 km3 by 2020, about 12 km3 of which will be lost due to to increase of water intake in other countries and other 6 km3 will be lost due to climate change. There is already a difficult situation on the Ural River. The volume of the river has decreased three-fold due to shortage of rainfall in 2008-2009 and reduction of water flow from the Iriklinskoe reservoir in the Russian Federation. This issue was discussed at the conference on water scarcity of the Ural River, which was held in February 2010 with participation of Kazakh and Russian experts. However Kazakh representatives received no definite answer on the question of increasing intake of water from the reservoir Iriklinskoe from their Russian colleagues. According to the deputy chief of the Lower Volga River Water Management Directorate Vasily Kazakov, despite decrease of reservoir amounting 1.1 billion m3 of water in 2008-2009, the flow of water is saved at the level of 25 m3/s, although, according to Kazakh colleagues, the desired stock level should be 60 m3/s. Thus despite call by President Dmitry Medvedev to pay greater attention to environmental problems of the Ural River, the problem was not solved at the departmental level, and in September 2010 during the Summit an agreement on joint use and protection of transboundary water bodies was signed, which provides for the establishment of the international fund of the Ural River. Meanwhile, the volume of water in the river continues to decline, and is now 5 km3 instead of the average volume of 11.5 km3. Since 70% of the water is produced at the Urals in Russia saving the river requires not only formal but also active participation of the Russian side, which is being said with ever greater insistence by their Kazakh colleagues. A more complicated situation with water supply in Syr Darya River, feeding the Aral-Syr Darya basin, forced Kazakh authorities to build Koksaray reservoir in addition to Shardara. The thing is that the valley of the river Syr-Darya is a source of water and hydropower for four countries: Kazakhstan, Uzbekistan, Kyrgyzstan and Tajikistan. Moreover, while Kazakhstan and Uzbekistan use Syr Darya mainly for irrigation, the main value of the river for Kyrgyz Republic is production of electricity from the runoff of Naryn River, which merges with Karadarya and forms Syr Darya. In summer the Kirgiz cascade hydropower downstream Naryn accumulates water in the reservoirs to use this water in the winter to increase the drain to generate additional volumes of electricity at lower flow of melt water from glaciers during this time. Those actions contradict with the needs of Uzbekistan and Kazakhstan, which are situated downstream and need irrigation water supply during dry summer period. This conflict of interests has created water crisis in the region, in which Kazakhstan, situated downstream, was in a losing situation. As a result, since mid-2000s regularly winter floods took place in the Qyzylorda region of Kazakhstan, caused by increased flow of water from reservoirs on the Naryn cascade despite the fact that in summer there was a shortage of irrigation water. To solve this problem, Kazakhstan was forced to make concessions and purchase electricity from Kyrgyzstan together with water in order to normalize the spillway of the Syr Darya, but additional volumes were lost in the Fergana Valley of Uzbekistan who did not fulfill its commitments to the passage of water to Kazakhstan. Due to failure of the parties to provide water resources Kazakhstan was forced to build an additional reservoir, reducing dependency on Kyrgyz hydroelectric power station, which led to reduction in volume of purchases of electricity and water from Kyrgyzstan. The latter, in turn, found itself in the uncomfortable position of risking losing the single consumer of energy. The severity of the problem of the river Syr Darya water resources is proved by the fact that over the past two years the parties could not agree on the amount of water intake. Nevertheless, early in the year the International Water Commission managed to agree on standards of water consumption in 2011, although the question of compliance with these commitments in the upper river region remains open as long as the parties failed to agree on the use of energy resources. 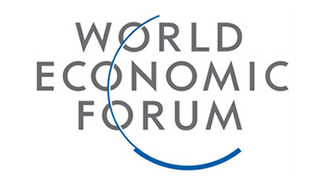 The discussion on the issue was postponed until the II quarter of 2011. However, while the dialogue within the former Soviet republics takes place at least in some form, the negotiations with China are much less dynamic. Each year the questions about the volume of intake and quality of water flowing back into the Black Irtysh and Ili, contaminated by pesticides and industrial waste, is raised, but the issue is not moving apart from monitoring. History of relations on the issue of transboundary rivers between present-day Kazakhstan and China dates back to 1992, when Kazakhstan sent draft agreement on the initiation river navigation to China. In 1994, China started construction of a canal Black Irtysh-Karamay, which caused concern not only of the Kazakhstan side, but also its neighbors Russia and Uzbekistan. In 1997 those countries sent notes on the use of transboundary rivers to the Chinese side, in response to which China has expressed willingness to negotiate with each side separately. As a result, the Kazakh-Chinese relations on the use of waters and the waters of transboundary rivers, the main of which Black Irtysh and Ili, until recently, were governed by the intergovernmental agreement on cooperation in the use and protection of transboundary rivers, signed September 12, 2001. However, this agreement does not contain any arrangements with respect to the volume of water intake by China and, in general, according to experts; the agreement was one-sided and rather formal in nature, reflecting mainly the interests of China. At the same time, rapid development of Chinese economy in the last decade and the construction of a canal Irtysh-Karaman, on which China takes almost half of the natural drainage, causes serious blow to the ecology of the Irtysh basin. Similar situation is now developing in the Balkhash-Alakol water basin. Because of the growth of intake in the upper catchment of the Ili River, which in 2009 amounted to 3.5 km3, Lake Balkhash is likely to repeat the fate of the Aral Sea. Meanwhile, water demand in rapidly developing Xinjiang Uygur Autonomous Region in the coming years will only grow, thus the question of reducing intake in China is not raised at all. In February 2011 on the summit an intergovernmental agreement on the protection of water quality of transboundary rivers was signed, according to which both parties are taking on very strict obligations to monitor water quality. However, according to Minister of Environment Nurgali Ashimov the parties have failed to develop a unified position with respect to water intake limits. Until now, China accompanied all its efforts on transboundary rivers with the assurances that “China will avoid national selfishness in this matter” and “would never agree to measures that infringe upon the interests of Kazakhstan”, but in practice, withdrawal from the headwaters of the Irtysh and Ili is increasing and has now reached a critical threshold. Reluctance of China to join the inconvenient for the country tripartite talks Russia-Kazakhstan-China on Irtysh waters issue is also alarming. Kazakhstan, which in water relations is in vulnerable geographic position, can only hope for good sense of the Chinese counterparts.